Recently Councillors and Shire management staff completed a Cultural Change Training Program provided by Kaata Tidje. Gail Reynolds-Adamson and Jennelle Reynolds presented the training and incorporated a tour of local sites and tastes of bush foods. 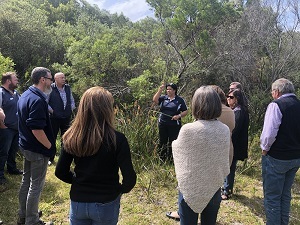 This was a fantastic opportunity to learn about the Traditional Owners of the Esperance region and the Aboriginal culture and history throughout Australia. The training will help guide Council to develop a robust Reconciliation Action Plan (RAP) and pave the way for future engagement activities with Aboriginal and Torres Strait Islander people in Esperance. The next step will be for Council to meet with representatives from Esperance Tjaltjraak Native Title Aboriginal Corporation to discuss the development and inclusivity needed to have a RAP that is supported by the Esperance community.